Finally, a working tool to unlock iPhone 4 has arrived. 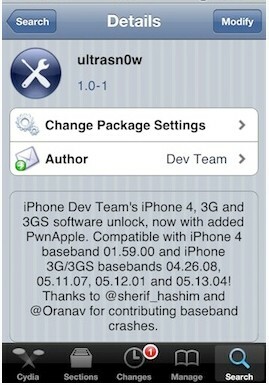 The iPhone Dev-Team released Ultrasn0w 1.0-1, that can be used to unlock iPhone 4, iPhone 3GS and iPhone 3G with iOS 4.0. The Ultrasn0w unlock for iPhone 4 baseband 01.59 will remove all the carrier limitations from the phone and make it workable with other phone networks in the world. 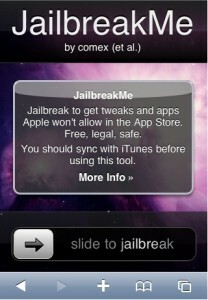 Before unlocking iPhone 4, we will need to jailbreak it using the Jailbreakme 2.0 tool that was released last day. Apple is working on a fix to prevent browser based jailbreak on iPhone 4. The next iOS update will fix those issues that made it vulnerable to jailbreak and unlock. Therefore, make it fast if you are planning to unlock your iPhone 4/ iPhone 3G that is using iOS 4. First go to jailbreakme.com on your iPhone 4 browser and complete the jailbreak process. It will add the Cydia installer to your iPhone 4 springboard. Now open Cydia and find out manage and sources section. Click on add button and add the Ultrasn0w 1.0-1 repository source URL (http://repo666.ultrasn0w.com) and select done. Now go back, open Cydia search option and find Ultrasn0w 1.0-1. Click Ultrasn0w installer and follow the on-screen instructions to complete iPhone 4 unlock process. iphone unable to grab indian market, but the phone looking dashing.., is it worthful to purchase. I imported iphone 4 from UK. it is locked now, i mean not accepting any sim. How can i unlock it? i buy a iphone 4 from u.k.. nw frm where can i unlock this phone. will it any charge 4 it. any amount ? &why the so much price difference of this phone in india? I bought Apple iPhone-4 Version 4.1, I am unable to use it, Its locked with AT & T.
Can any one suggest me how to unlock it. I bought Apple iPhone-4 Version 4.1 in US , I am unable to use it, Its locked with AT & T.
I brought iPhone 4 from US and its locked with AT&T apart from http://gevey-3g.com/ is any other solution available in India.? If yes whats the price. ?